Zip! Zap! Pow! Whoosh! Bursts of energy shift stagnant forms this week. Mercury in Virgo and Venus in Libra are the instigators of this tectonic shifting. In the hierarchy of planets, Mercury and Venus are often under-valued for their influences. Astrologers get very impressed by Saturn transits, or this Uranus/Pluto square we keep talking about, and sometimes overlook how essential and influential the faster, more personal planets are. Thought and Love, under the purview of Mercury and Venus, are not minor things. In fact, I really can’t think of anything more influential. The week is big in minor ways. When the planets are stimulated by new encounters with each other, it is a mirror for how we also are being stimulated by new encounters. As in all new experiences, there can be a blend of delight and upheaval as we make adjustments. What happens when thoughts are introduced? How do you respond when a new perspective on love suddenly appears? I invite you to expand your notion of what Thought means and what Love entails. I will be joining you, and at the same time observing how Mercury and Venus may influence my lunar intention* for this cycle. This intention began as a vow to share my gifts with the world and has become this simple thought: I dare to live wholeheartedly. I am learning that a whole heart means I don’t turn my back on my imperfections. It is important to invite them back into my heart where they originated. Wholeheartedness also means I am embracing my power and gifts. What might Mercury teach me this week concerning this intention? In Virgo, I expect that I will be even more sensitive to my imperfections and even more desirous of improving my methods. We can also expect to notice how influential our thoughts are to the task of radical self-acceptance. New thoughts are coming our way. What state of mind and heart helps you to prepare to best use these thought forms? I invoked the name of Love, but Venus has a way of showing us new sides to this essential emotion. Aleister Crowley famously declared, “Love is the law, love under will,” and he was right. Love is more than emotion and it is all emotion. Love runs the world. What does Love make you do? Venus is feeling fierce as this planetary ally completes a Grand Cardinal Cross with Jupiter, Uranus, and Pluto. This aspect pattern is provocative. Notice your own fierceness about fairness, justice, and love. If you were to be guided by Love this week, how might this impact your wholeheartedness? Monday, August 26. The Moon in Taurus provides grounding today. Good thing, because Neptune is inviting in dreams as it opposes the Sun. As the symbol of wholehearted self-acceptance, the Sun reminds us that this solar journey of enlightenment also includes moments of shadow. Strength does not come from an impenetrable shield but from the resilience created from accepting all our contrary emotions. Keep that thought in mind as Venus gets all up in our face, provoking other responses. Venus is quincunx Chiron and opposite Uranus. When faced with people or situations that seem unfair we want to both fight and to empathize with our opponents. Notice this paradox; it may help us evolve other ways to create change in the world. Tuesday, August 27. There’s a high quotient of Mercury and Venus influence today. (See the intro to this week’s forecast. *) Mercury in the industrious sign of Virgo is in a favorable aspect to Saturn. It feels good to get things done, especially in the realm of purging our environments of needless chaos. Be gentle with yourself concerning perfection. Small steps can be celebrated. Venus square to Jupiter (following on yesterday’s opposition to Uranus) is still touchy. Not only is our sense of injustice peaked, but anything that seems unharmonious must be addressed. Notice how Love and Balance are related. Where do you find the balance in your life? Tonight, Mars enters Leo where it will remain until mid-October. Mars in this sign is the champion of our wholeheartedness. We get another boost of energy on the quest for self-love. 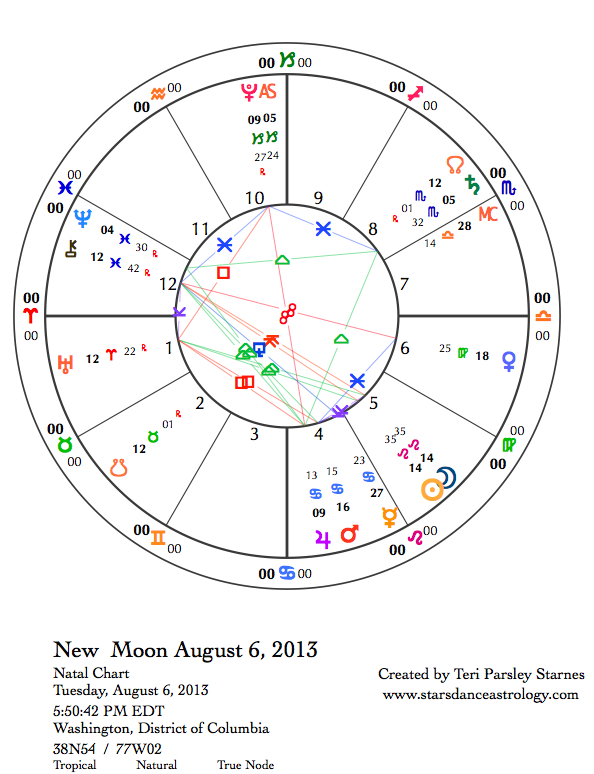 August 28—Last Quarter Moon: Evaluating. As the last week of this lunar cycle begins, we notice that the energy has shifted. Perhaps what felt like a grand adventure of self-discovery beginning just three weeks ago, now might feel now like a foolhardy experiment. Since we are human, we know not everything we tried was successful. That isn’t the real challenge at this phase of the Moon. The real challenge is how we embrace that imperfection. I write often about Brene´ Brown’s brilliant writing on the subject of wholeheartedness and the gifts of imperfection. In case you are new to my writing and don’t know about this source of inspiration, I’ll plug her again [http://www.brenebrown.com/]. Even though the lunar cycle is winding down, there are still important things to discover about accepting our inherent worth. The Leo mission isn’t over. 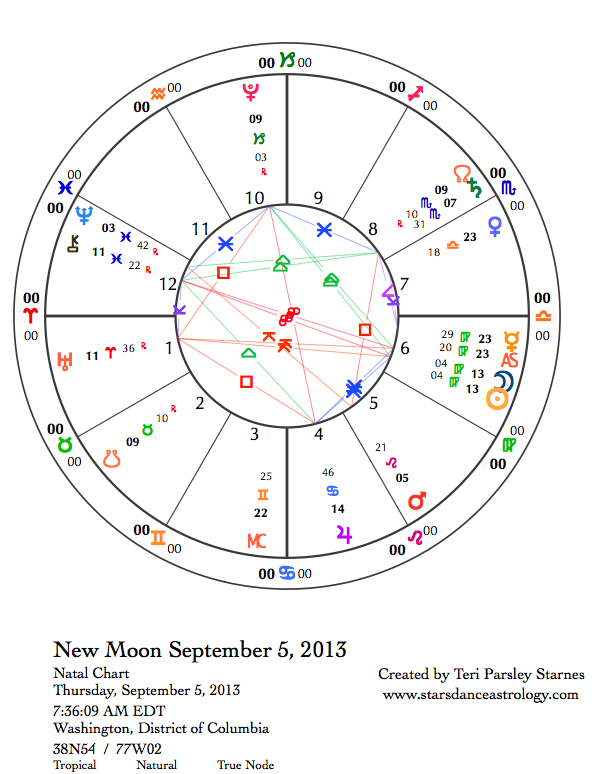 Last night (in the Central Time Zone), Mars entered Leo, the sign of the New Moon that began this lunar cycle. Sometimes Mars asks us to take risks—to step out just a little farther than we are used to—to claim new territory. What scares you the most when asked to identify why you are important to this world? Dare yourself to be the steward of that gift. We get a boost from Pluto today. This comes in the form of aligning ourselves more strongly with our values. The Moon in airy Gemini is stimulating our thoughts. Yes, this can be exciting, and can you slow down just a bit to enjoy the moment? Friday, August 30. Another quality, strong in Virgo, is the desire to be of service. Mercury in Virgo is in complete agreement with Jupiter in Cancer, that being useful for the benefit of others is a worthy ambition. It feels good to step outside our ego desires to devote ourselves to serving others. That doesn’t mean that service is automatically an egoless action. Far from it. As we make peace with our wholeheartedness, observe whether you are bringing a hungry desire for attention into your service. The balancing act doesn’t end there. We must also notice whether we are trying to escape what our healthy egos require by disappearing into another’s need. To be involved in just the right service in just the right way is a blessing that feeds the soul. Saturday, August 31. Yesterday’s harmony might give way to annoyance today. If we are lucky, that is all it will be. Today, the Moon antagonizes the Cardinal planets. These are Venus in Libra, Jupiter in Cancer, Uranus in Aries, and Pluto in Capricorn. The touchiness stems from emotional sensitivity and perhaps a needless sense of urgency. The way to resolve tension may be to cultivate these planets as allies: to find balance with Venus’s help, to honor our deep emotions with Jupiter’s help; to claim our authentic selves with Uranus’ help; and to live into our power with Pluto’s help. That seems like a lot, doesn’t it? Don’t worry; we don’t have to get it all right in one day. These planets will be offering these opportunities for a good while more. Opposite signs of the zodiac need each other. That mirror on the opposite side of the year reflects another side of the sign to us. Without the perspective of the opposite sign, we never really see the whole picture. Every Full Moon offers up this illumination: to understand something in wholeness. Perhaps no two signs reveal so much about the other as do Leo and Aquarius. Leo is the individual as Star, the one who is special and unique. Aquarius is the Collective of all those stars, which become the audience and reservoir of collective instincts. Aquarius insists on equality. Leo insists on specialness. It seems like these two instincts couldn’t be farther apart yet they are really two peas in a pod, with the pod being Humanity. The Full Moon in Aquarius this week is an opportunity to experience how collective instincts and individuated ego push against each other even while needing the other. This month, the Leo lunar intention * is to dare to live wholeheartedly while dwelling in that sweet spot of ego—not too hungry for attention and not too full or ourselves. The collective helps us to know that sweet spot. In the best situations, the group affirms our gifts and tells us we are valuable. It also tells us when we’ve got more ego work to do. The work of Aquarius isn’t only about making sure our egos are in healthy balance, though sometimes it seems that way. This is perhaps only a by-product of what Aquarius is really going for, which is daring to take the next evolutionary leap. Humanity has not found its final destination—far from it. We’ve got a long way to go. Aquarius dreams the dream of change and pushes us to the edge of possibility. When we do our ego work. When we affirm we are essential members in this tribe of Humanity and that we have gifts to give, when we know the healthy edges of our egos, only then are we ready to take the next evolutionary steps into Humanity’s potential. The push back of Aquarius is asking us to be more, not less. Being more, not less, is a guiding principal for the rest of this lunar cycle. We need change. Transits this week remind us of the ways things need to change and the ways that change is always happening. Wholeheartedness affirms that we can be the ones who bring the right changes forward. We can be the ones we’ve been waiting for. Sunday, August 18. Most of the day, the Moon is in Capricorn, so we don’t quite enter expansive Aquarius energy until tomorrow. Today, we are more conservative. The Moon opposes Mars. What provokes your strongly protective feelings? Our hearts are telling us what really matters. This feeling may be so strong that survival instincts are triggered. Another choice: use the Capricorn energy to affirm your expectations and then use the Mars in Cancer energy to act with all your heart to create a supportive environment where those expectations can flourish. Monday, August 19. We teeter between feeling expansive hope about change and being burdened by the realization of how much work it will take to manifest. Egos might get bruised today too as the Aquarius energy pushes back on any sense we have that we are special. How do these obstacles invite you into believing you are more, not less? What dream will you serve? You might want to pay attention to the messages from your actual dreams tonight. Neptune and Venus are asking us to step beyond the bounds of reality into longing. 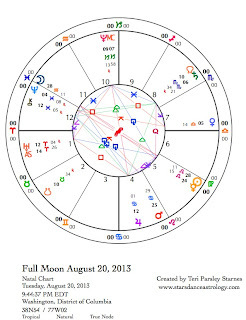 Moon enters Pisces 11:43 pm. 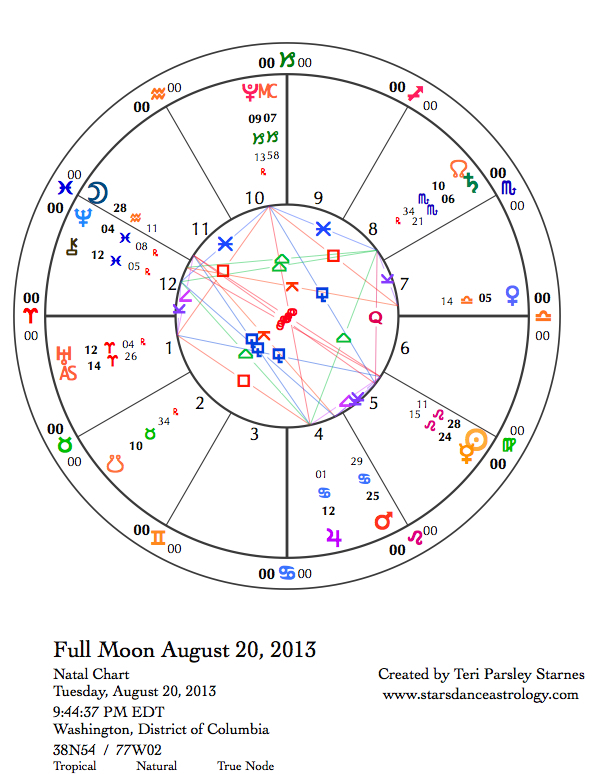 August 20—Full Moon: Illuminating. The Full Moon in Aquarius illuminates our Leo intentions. We may be experiencing a bit of the “push back” that both of these signs give to each other. If you are sensitive to feeling other people’s energy fields, you might even think about what it feels like when your aura rubs up against another’s. Is there a little friction? Do you recoil or get annoyed? It takes generous space to make room for everyone else’s energy. Give yourself that space today in order to appreciate how necessary every single one of us is to the whole. The sweet spot of ego balance can feel a lot like the sweet spot of community—not too close so we feel smothered and not too far apart so we lose connection. From that sweet spot, begin to integrate other qualities present at this Full Moon. There are many. The only constant is change. That message seems even stronger at this Full Moon. Uranus, the ruler of Aquarius, is the provocateur of change. Tomorrow Jupiter will square Uranus exactly but we feel this expansive and unpredictable energy now. Attachment to stability is wearing away. Systems are seen more and more as not working. Jupiter in Cancer calls attention especially to the realm of home. Uranus in Aries provokes change through action. The other significant influence is Pluto in Capricorn, which is moving into its next exact square with Uranus in November. This planet encourages change too, the kind that transforms through a dying process. Since June 2012, Uranus and Pluto have been moving in and out of exact square aspects with each other, which continue until the last one in March 2015. Now that Jupiter is here too, the process of change and transformation will speed up. That is Jupiter’s quality. The influence of water, very strong in last month’s lunar cycle, is still influential. Jupiter, already noted for its importance, is in a water sign and is in trine aspect with Saturn in Scorpio and Chiron in Pisces. (Neptune in Pisces and Mars in Cancer contribute are in water signs too.) We can’t leave our emotions behind in our revolutionary fervor. In fact, it is really important to retain empathy, compassion, and vulnerability as we make change happen. Water signs invite intimate connection. We can’t as easily objectify and blame another when we know we are the same. Venus in Libra is a new influence right now and will be even more important at the end of the week. Venus rules this sign of the scales and stands for a renewed desire for justice and fairness. Notice this energy as it grows in strength this week. allow those thoughts to deepen. Breathe and sense into your heart. Our hearts are a source of wisdom that can be trusted even when we don’t know what our next steps should be. This would be a wonderful day to bless the waters and be blessed by them. Thursday, August 22. In the intro to this week’s forecast, I pointed out how important the opposing signs are to understanding an integrated whole. The Sun enters Virgo today while the Moon is in the late degrees of Pisces. Next month, we will experience these two opposing signs at the Full Moon. Today is a peek at that illumination to come. We’ve been awash in Pisces Moon energy. Sensitive souls will notice their own edges are little less distinct. The urge to merge is huge. Virgo, as an earth sign, asks us to put our empathy into meaningful service. It’s quite refreshing, actually, to know we have limitations on just how much we can do to save the world. Enjoy the balance between feeling and doing. Friday, August 23. First of all, let’s enjoy paying more attention to the details today. Mercury moves into Virgo, a sign it rules, and helps us to focus on our next steps. It is important to breathe through any stress we are under as the Moon in Aries is triggering the t-square aspect pattern present at the Full Moon (Jupiter opposing Pluto and squaring Uranus). Our attention shifts away from intuition into action and reactions. Not everything is going to go our way today. We might act hastily or witness others being impulsive. Those are the stressors, but Mercury can act as an ally. We are able to break down the process of a big job into smaller more manageable parts. Don’t sacrifice the means for the end. How we get where we are going is as important as where we want to go. 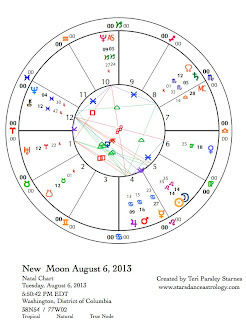 August 24—Disseminating Moon: Sharing. This phase of the Moon reminds me of the season of harvest—what have we brought in from the garden? What do we have to share? Remember, the crop for this cycle is about living wholeheartedly in the light we have to share. Have you risked being bigger than you thought you should be? Have you learned from the “push back” coming from community about your ego demands? The light and shadows of our experiences are all useful additions to growing wisdom. These lessons invite balance. Notice your state of balance today. 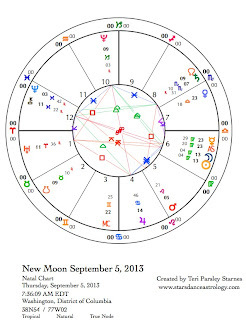 Venus in Libra created a Grand Cardinal Cross aspect pattern yesterday that is present today too. The planets involved are Jupiter, Uranus, Pluto and Venus. Injustice feels like a huge imbalance. And we are much more apt to do something about it with the Moon in Aries egging us on. What does equanimity mean to you?